Simply stunning spring bloomer! Reliably bringing colour back to your garden with displays that get bigger and better each year! Unusual, raspberry-ripple coloured, funnel-shaped flowers will make your containers and borders a talking point. Flowers soon after planting from November onwards, all the way to spring, giving you plenty of colour and interest for months - great value bulbs! This South African Native is perfect for pots or the front of borders, where it forms a neat mound of leaves. Supplied as a pack of 10 corms for immediate planting. This native of South Africa is simply beautiful! You will see the raspberry ripple coloured, funnel shaped flowers appear soon after planting from November onwards. Perfect for the front of pots or borders. Grow them on pots on your decking, balconies or terraces - they really are a joy to behold and the flowers will make your garden a talking point! They're really easy to grow, and being so exotic looking, your friends and family will truly thing you are blessed with green fingers! 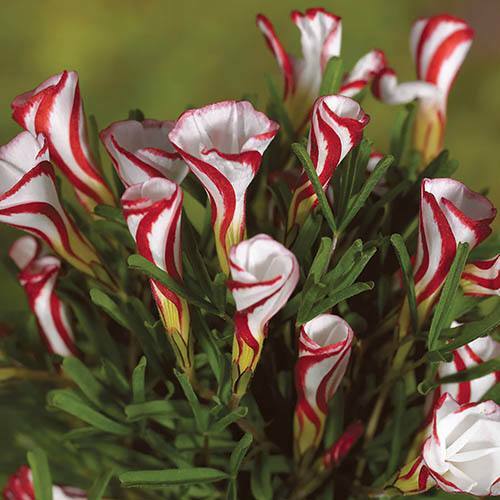 Stunning when in full bloom, the flowers are even more striking when in bud, when the flowers are marked with vivid crimson-pink stripes, hence its more common name, the Candy Cane Sorrel. This delightful little plant is something uniquely special, with its bright white, funnel-shaped flowers edged with colour. Even when not in flower, this striped oxalis will continue to delight with its mound of green leaves which forms in spring, adding subtle texture and colour to your garden. Supplied as a pack of 10 corms, ready to be planted out now. Supplied as a pack of 10 bulbs, ready for planting. Height 15cm (6in). Note - these bulbs are very small, do not be alarmed. After flowering, leave the foliage to die down naturally and cut back when it has turned yellow. The small bulbs of Oxalis Versicolor will naturalise over the years and the soil should be kept rather dry in the early summer until the plant starts growing, before returning to regular watering. Add a layer of horticultural grit to the planting hole to improve drainage as the bulbs do not like cold wet conditions. Use a general purpose feed through the year. Bulbs are frost-sensitive and should be protected overwinter with a layer of straw or fallen leaves.